You may have heard it elsewhere as the “600 rule”. I first heard about the rule while visiting the Looney Bean in Bishop, California in 2008. Five photographers sitting in a coffee shop poring over their laptops reviewing what they recently bagged are bound to start talking. It was my good fortune that one of those present was the very talented Brenda Tharp who first quoted the 600 rule to me. I, however, have repeated the rule as the “500 Rule” because I think 600 is overly optimistic. What is the rule? The rule states that the maximum length of an exposure with stars that doesn’t result in star streaks is achieved by dividing the effective focal length of the lens into the number 600. A 50mm lens on a 35 mm camera, therefore would allow 600 / 50 = 12 seconds of exposure before streaks are noticeable. That same 50 mm lens on a 1.6 crop factor camera would only allow 7.5 seconds of exposure. But Wait. The Rule Isn’t All That Great! The real number is quite subjective. 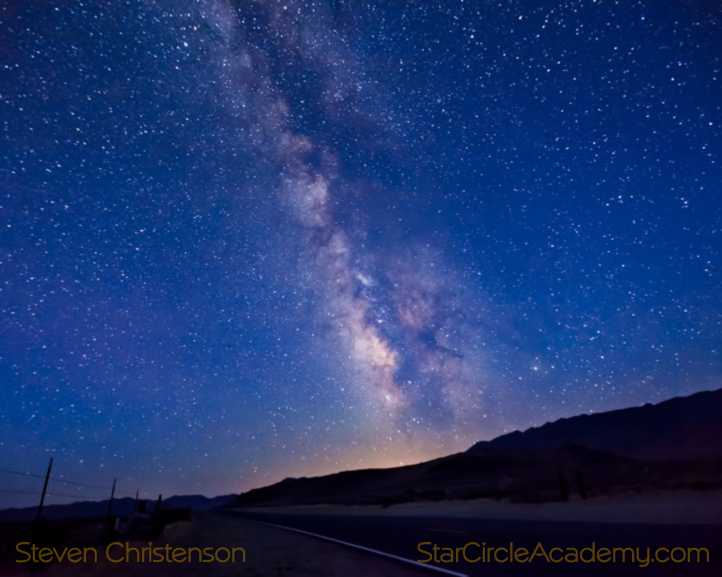 A little math reveals that on the Canon 5D Mark II (a full frame camera), with a 16mm lens a pin point star on the celestial equator moves from one pixel* to the next in 5.3 seconds. But the 600 rule would allow 37 seconds of exposure and the 500 rule 31 seconds. Both rules will produce streaks on the sensor! The visibility of those streaks will depend on the finished print size and viewing distance. Print it large and stand close and the streaks will be obvious. 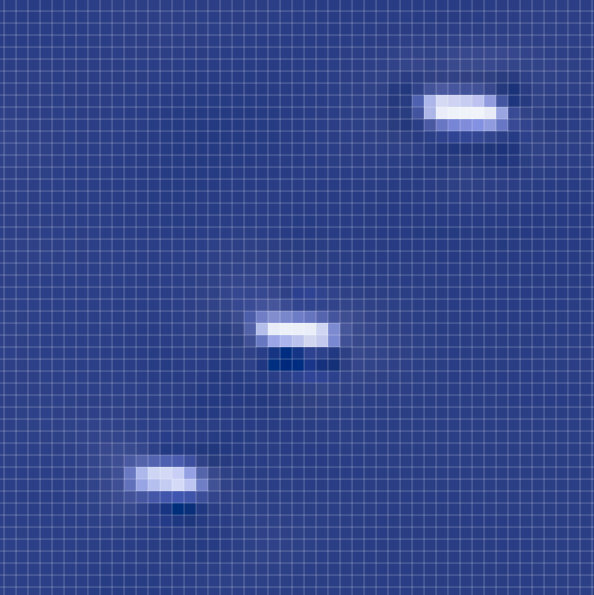 Clearly those stars are streaking across about 5 pixels* just as the math would bear out. What is going on here? The Canon 5D Mark II images are 5634 x 3753 pixels* from a sensor that measures 36 x 24 millimeters. Dividing 36 by 5,634 reveals that the distance from the center of one pixel* to the next is a scant 0.00639 millimeters (or 6.4 microns). Where t is time in seconds, f the effective focal length and 13750 is, well 13750. I’ve simplified the above from the full equation. Is the math scaring you a bit… don’t worry… we’re almost done. Earlier we calculated the pixel* to pixel distance as 0.00639, what we want to find is how long (t) it takes for a star to move that far on the sensor. Solving for f = 16mm we get a t value of 5.3 seconds as I asserted earlier. But how does that calculate out on a different sensor, the Canon 50D, for example? The Canon 50D has 4770 pixels across 25.1 mm or an inter-pixel* distance of 0.0053 millimeters. Substituting into the earlier equation we find that a star marches across a pixel on the 50D with the same 16mm lens in 2.83 seconds. With a 50mm lens on the same camera… the bad news is the star is speeding from one pixel* to the next in less than a second! What does an image look like with a 30 second exposure at 16mm on a full frame camera? Remember that the streaks will be 40% longer on the cropped Canon 50D. 30 Second Exposure – a close look shows elongated stars. Scaled down to only 16% of the original image size or seen from a distance no streaking is obvious! We will try not to twitch knowing – because we pixel peeped – that the stars are really dashes not nice round pinpricks of light. 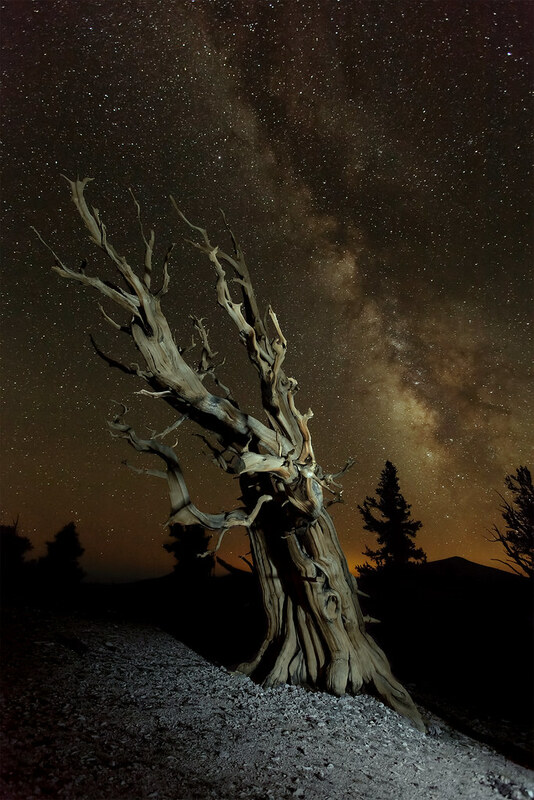 And indeed only the eagle eyed are likely to notice the dash-like nature of the stars until the photo is printed large, say at 20 x 30 inches. Streaking starts a LOT sooner than any rule you may have learned. The time it takes to streak depends on the inter-pixel* distance (sensor density / mm) and the focal length. How much streaking to allow depends on your aesthetic tolerances. You can not get more or brighter stars by exposing longer; starlight has already given up on one pixel* and moved on to the next in just a few seconds. The longer the focal length, the more impossible it becomes to prevent streaking. Gaps in your star trails may be unavoidable if the inter-shot delay (normally 1 second) is long enough to skip pixels*. I carefully added asterisks* to every location where I wrote the word “pixel” in a way that might imply your camera collects light in pixels. You might be wondering why I did that. The answer is: your sensor is comprised of sensels, not pixels. It takes 4 to 9 sensels to create a single pixel depending on the de-mosaic-ing algorithm your camera uses. Maybe you aren’t that picky, but I didn’t want to hear complaints from the purists. I particularly relish this epiphany because I reported long ago that “longer exposures do not result in more stars“. I just never got around to doing the extra bit of math – or the experiments – to prove out my assertions. A commenter has rightfully taken me to task by pointing out that the perception of a streak is dependent on many things other than just the actual sensor values recorded. In particular, if the image is not enlarged much some streaking will be scarcely or completely unnoticeable because the feature will be too small for the eye to perceive. The problem with this assertion is that it assumes a lot of preconditions: e.g. how large the print is, how far from the print a viewer stands, and the subjective experience of the viewer. My real world experience has led me to conclude that it is a reasonable goal to keep the streaking to 2 to 3 pixels or less because that will provide the greatest possible usable magnification (finished viewing size). There would be no point to collecting a high megapixel image if you can not produce a print proportionately larger or more detailed than a lower megapixel image! Here is an example that makes my point. I love this image captured on a Canon 5D Mark II. When printed at 20×30″ and viewed at 4 feet there is some streaking. Perhaps only a critical eye would notice, but even an untrained eye will notice when viewed from two feet away. This entry was posted in Gaps in Trails, Image, Trivia and tagged 500 rule, 600 rule, gaps, guidelines, inter pixel distance, mathematics, microns, pixel density, pixel pitch, rule, smearing, star photography rule, streaking, trailing on June 24, 2012 by Steven Christenson. Very informative, and precise information,explained in simple language for most to understand. Great article, thanks! Any idea how your equation changes about the Canon 5DSR (i.e., 50mpxl and no anti-alias filter)? 8712 pixels in 36mm yields 0.00413 mm pixel to pixel distance. So that comes out to 3.55 seconds to get a pixel-wide star smear with a 16mm lens. That number is 5.3 for the 5DII, and 2.83 for the 50D. Lack of a blur (anti-alias) filter may cause more artifacts, but the math would be the same. “Five photographers sitting in a coffee shop pouring over their laptops…” Why are they pouring coffee over their laptops? Did they get fed up with Windows 10? 🙂 Thanks. We will make another donation to charity. We do this when we have grammatical or spelling mistakes go unnoticed by us. Thought I’d give my take of the optimal exposure time, purely theoretical of course. Where ‘s’ is sensor size, ‘f’ is focal length and ‘r’ is resolution. If it’s diagonal, horizontal or vertical really shouldn’t matter much, as long as you don’t mix them up of course. I gave it a go using my a6000 and my 28mm lens as an example and got ~3.5 second, which doesn’t sound unreasonable. The limit if you wish, is set to the time it takes a point lightsource to travel the distance of 2 pixels, purely to ensure that it gets to travel across an entire pixel. In case of the example with the canon 5d mk2 with 16mm lens, I thus get 7.6 seconds, as opposed to 5.3. Not really sure how that works, but I suppose there is a number of ways to do the math. For example, I’ve assumed that the speed is constant across the sensor, which isn’t really the case, so I suppose at the edges it may indeed be 5.3, but taking that route, it is hard to keep the maths simple I think. Anyway, there you have it. My original equation was simplified to calculate for the speed of travel of a star at the celestial equator e.g. Mintaka in Orion. At the celestial equator a star moves much faster than a star near the poles. Then, as you note, the additional gotcha is the actual direction it travels across your sensor. Sorry for being late in the game but I am trying to calculate the values for my m43 Panasonic G9 for the following lenses – 12mm end of 12-60mm PL and 15mm for PL 15mm 1.7. – Should it be t = 0.00333/(24mm/13750)? I am not sure if it takes 3.8 seconds to hop from one pixel to the other (12mm) or 1.9 second (2 x 12mm giving FF equivalent of 24mm). Thank you so much for your help, I am trying to figure the best settings for my attempt to astrophotography on Tenerife in a couple of days! Effective focal length would be 12mm * 2 (your crop factor), so the second calculation is what you should use. Note that there was considerable push back from readers on this subject, and it is definitely worth wading through the comments. Good luck in Tenerife! Come back and share your favorite shot. Oh, and remember the point of the article was to point out that the 600 (or 500) rule is not a very good rule. There isn’t an answer to this question as stated. If you’re using a telescope with a focal length of 750mm then by the math, you’ll have fractional seconds before stars start smearing. But when using an apparatus like you described, you’re very likely to use the tracking system of an alt-az or equatorial mount as you’re then in the realm of deep sky astrophotography. Using such a tracking device, the length of exposure will be limited by your tracking accuracy.